Towels are one of the essential pieces of swim equipment for swimmers. Here’s a breakdown of our favorite towels for swimmers. Along with your suit and your top pair of swim goggles the swim towel is one of the essential items you need to conquer the water. 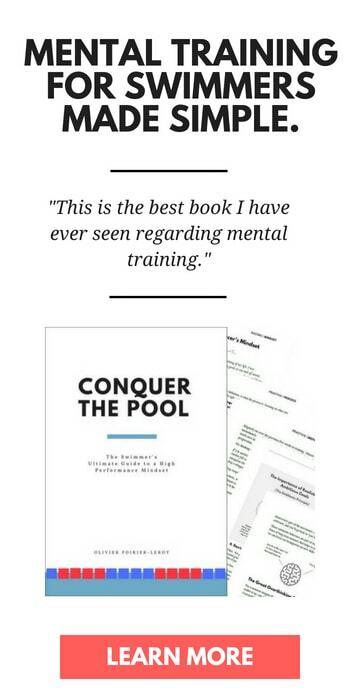 Its function is dramatically simple: to help you dry off ASAP and in comfort after the long bouts of training and bursts of speed in competition. 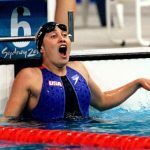 While basic in function, towels can be problematic: most traditional towels take forever to dry off, which isn’t ideal when most of us are swimming two-a-days or when we are at a swim meet getting in and out of the water multiple times per session. A wet towel at the bottom of your swimming bag makes for a heavy, water-logged bag. It also makes drying off later on in the day in competition a soggy drag. 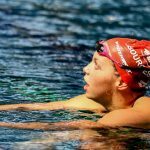 Picking out the best swim towel for your time at the pool can help you dry off faster and make sure that you are leaving the chlorinated water behind. 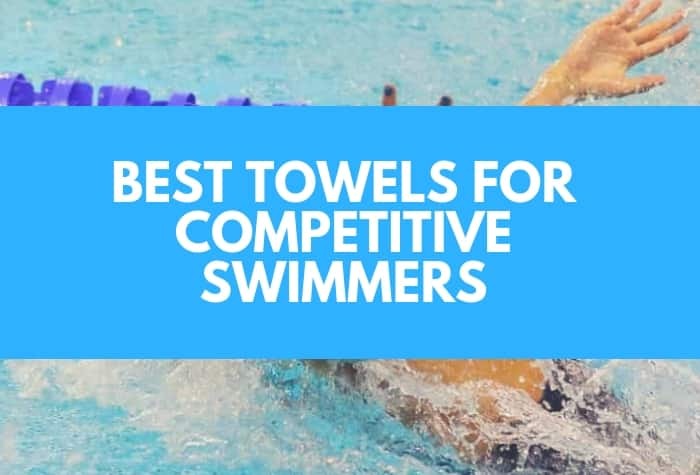 Here’s my selection of the best towels for swimmers. When it comes function, nothing out-performs the Arena Halo Micro-fiber swim towels. While you don’t get that same sense of “wrapping yourself in a blanket” that comes with the thick cotton towels, for competitive swimmers, who are in and out of the water multiple times a day, the Arena Halo micro-fiber towel is a no brainer. It’s tiny on size. Rolled up it’s the size of two balled up fists. 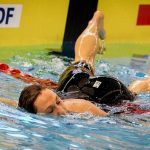 This is key given how much other stuff we tend to cram into our swim bags. It dries super fast. Given that we train a lot and compete even more, having a towel that can take repeated soakings and dry quickly is imperative. Nothing worse than having a towel that is sopping by the end of the day at a swim meet. Will soak it all Once I have dried off I wrap my mesh bag with the towel and place it into my swim bag. The reason is that my mesh bag, no matter how many times I try to wring it out after practice, is dripping like crazy from soaked swim gear (particularly my DragSox) and will soak through my swim bag. The Arena microfiber towel handles this task admirably as well. The thing is a monster. 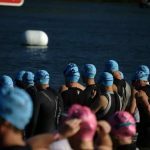 The swim towel is made of 80% polyester (the same long lasting material your drag suit is made of) along with 20% polyamide (the quick drying feel of the towel). 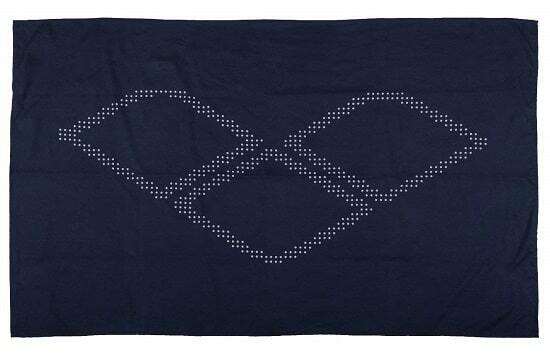 The Arena Halo swim towel comes in a of bunch of different colors and has the Arena logo stretched out across the top. Form, style and function. Boom. Like the Arena micro-fiber towel, the TYR Dryoff Sprot swim towel is ideal for swimmers who are constantly getting in and out of the water. 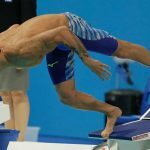 You know how divers are usually seen wiping themselves down quickly with a small towel between dives in practice and in competition? This is the kind of towel they are using–it feels almost rubberized, dries almost instantly, and can be used over and over again without getting water-logged. 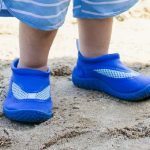 It’s kind of ridiculous, really–they can absorb a metric ton of water without holding onto it, making it ideal for swimmers (and divers!) who want big function and small size. 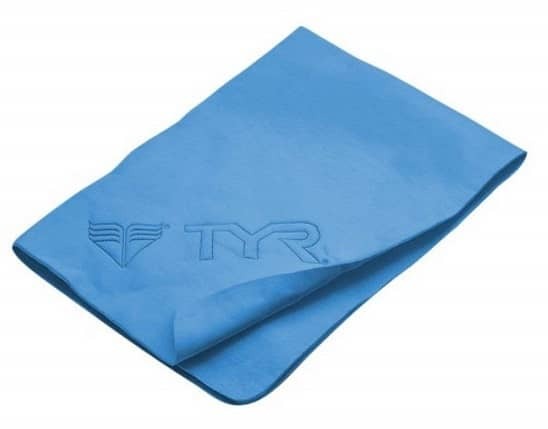 The TYR Dryoff towel comes in two different sizes (Large: 26×17″ and Small: 17×13″), comes with a plastic case to store it in, and should be a left a little moist to preserve the texture and shape. Seems counter-intuitive, but storing the towel a little bit wet in the plastic container will help it keep from cracking. Another one of the small (and by small, I mean 13×17″–basically a hand towel) swim towels in our little list is this offering from Flow. 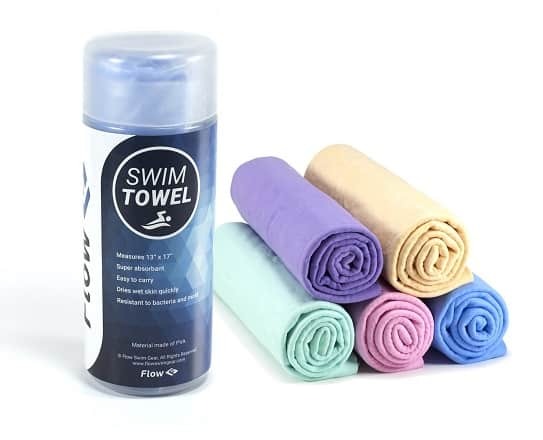 With five different colors to pick from, and a slightly cheaper price point then the other swimming towels on this list, the Flow Swim Towel is a solid option. The hilariously absorbent and fast-drying towel will keep you dry between races adn save you big-time on space in your bag. Wash with warm soapy water and like the TYR Dryoff Sport, store it slightly moist in its plastic container between swimming workouts. 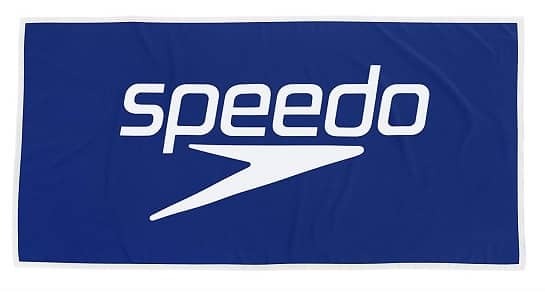 We’ve extensively covered Speedo products on this site, including Speedo goggles and their collection of kneeskins and jammers. With this swimming towel it’s straight up old-school 100% cotton with a big, greasy Speedo logo across the top. Not much more to say besides the fact that sometimes you just want to wrap yourself with a nice and thick towel after practice or a race. This towel is that towel. The 5 Best Chlorine Removal Shampoos for Swimmers. Keep your hair healthy and chlorine-free with this set of chlorine removal shampoos. 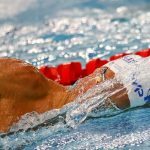 The 7 Best Goggles for Swimmers. Looking for the ultimate pair of goggles to dominate the pool? Our comprehensive guide of training and competition goggles has got you covered. 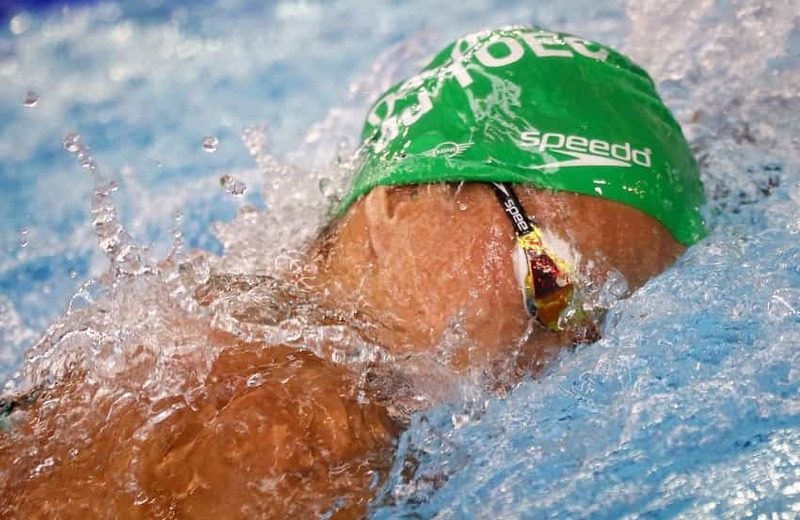 The 5 Best Prescription Goggles for Swimmers. Ready to take on the pool, but want to be able to take your prescription with you? 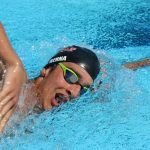 Here are the best prescription goggles for swimming.